The article below is by Professor Marie Louise Chaumont. This originally appeared in the CAIS (Circle of Ancient Iranian Studies) venue. The CAIS site is hosted by Shapour Suren-Pahlav. Note that the article originally appeared in the Encyclopedia Iranica. BŌRĀN (Pers. Pōrān, Pūrān, Pūrāndoxt), Sasanian queen, daughter of Xosrow II (r. 590, 591-628). There are extant coins of Bōrān dated from the first, second, and third years of her reign (de Morgan, p. 329, fig. 418; Göbl, pls. XII, XV). She ascended the throne in the year that ran from 17 June 629 to 16 June 630, according to Sebēos (p. 28, tr. p. 89) in the spring of 630 following the murder of the usurper Šahrvarāz, though she was not the wife of the latter; rather, she must have been the widow of Kavād II Šērōē/Šīrūya (r. 628; Anonymous Syriac Chronicle, ed. Guidi, p. 30, tr. p. 26). [Click on image to enlarge] A reconstruction of the late Sassanians at Shiz (Takht e Suleiman in Azarbaijan, northwest Iran) by Kaveh Farrokh (painting by the late Angus Mcbride) in Elite Sassanian Cavalry. To the left rides a chief Mobed (a top-ranking Zoroastrain priest or Magus), General Shahrbaraz (lit. “Boar of the realm”) is situated in the center and Queen Boran (Poorandokht) leads to the right. Some authors place her reign at one year and four months, others at one year and six months; Sebēos (p. 28, tr. p. 90) puts it at two years. In fact, Bōrān probably died in the autumn of 631 (cf. Nöldeke, Geschichte der Perser, p. 433), in the third calendar year of a reign that cannot have exceeded a year and a half. According to the Anonymous Syriac Chronicle (loc. cit.) and the Chronicle of Seert (II/2, p. 259), she was strangled. The Chronicle of Seert gives the name of her murderer as Pērōz, general of the Persian army. 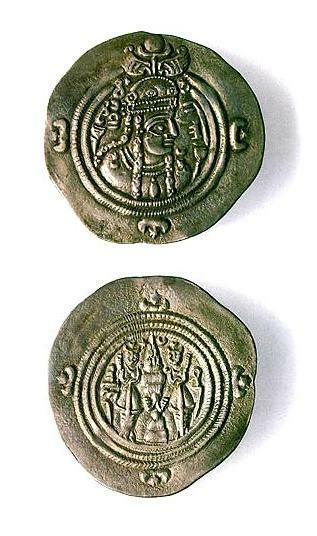 Late Sassanian coin depicting a portrait of Queen Boran (also Poorandokht or Pooran). Note Zoroastrian symbols at back of coin. According to Tabarī (I, p. 1064; Nöldeke, pp. 390ff. ), she elevated Fosfarrūkh, the author of the plot against Šahrvarāz, to the post of vizier (i.e. wuzurg-framadār). According to a different tradition, she is supposed to have put Farroḵ-Hormozd, Prince of Ādurbādagān, in charge of the government (Sebēos, loc. cit.). The major event of her reign was the dispatch of an embassy to Emperor Heraclius, led by the catholicos Išo’yab III and other dignitaries of the Persian church (Anonymous Syriac Chronicle, loc. cit. ; Chronicle of Seert II/2, p. 237). This mission had as its purpose to resolve several matters at issue between the two powers: In particular, it is supposed to have resulted in the restoration of the True Cross to Heraclius; in fact, the cross had already been restored by Kavād II in 629 (cf. Nöldeke, p. 392 n. 1). M. Alram, in Iranisches Personennamenbuch IV, p. 213. Anonymous Syriac Chronicle, ed. I. Guidi, CSCO 1-2, Scriptores Syri III/4, Leuven, 1903. Chronicle of Seert, ed. A. Scher, Histoire nestorienne (Chronique de Séert) II/2, in Patrologia Orientalis XIII, 1919. Dīnavarī, ed. Guirgass, pp. 116ff. P. Gignoux, in Iranisches Personennamenbuch II/2, 1986, p. II/58. R. Göbl, Sassanidische Numis­matik, Braunschweig, 1968. Justi, Namenbuch, p. 70 (q.v. for different explanations of her name in the sources). J. Labourt, Le christianisme dans l’Empire perse, Paris, 1904, pp. 242f. M. I. Mochiri, Etude de numismatique iranienne sous les Sassanides II, Teh­ran, 1977, p. 518. J. de Morgan, Manuel de numisma­tique orientale de l’Antiquité et du Moyen Age I, Paris, 1923-36. Sebēos, Sebēosi episkoposi i Herakln, ed. K. Patkanian, St. Petersburg, 1879; tr. F. Macler, Histoire d’Héraclius par l’évêque Sébêos, Paris, 1904.